New “ANTI-AGING” facials starting from April!! Slimming and Lifting Dual Facial Treatment. 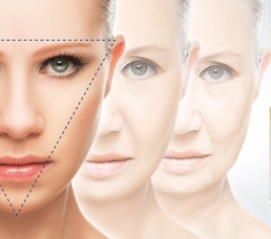 SLIM-FACE-LIFT treatment has been developed for everyone wishing to effectively fight against the signs of facial aging, without resorting to an intensive and invasive surgical treatment, but preferring a natural result. This facial involves a specially adapted technic for treating fatty volumes migrating at the bottom of the face, sagging skin on the cheeks and double chin and is to treat the drooping and sagging of various face areas by repositioning the volumes. The treated regions are: cheekbones, cheeks, oval of the face. SLIM-EXCESS®: is a solution of marine oligosaccharides. Refine the cheeks and the neck to reshape the oval of the face. UPLEVITY™: stimulates the skin elasticity, provides a long-lasting tightening and lifting effect. The skin is rejuvenated. RENOVHYAL: based on hyaluronic acid, fills wrinkles and limits the appearance of chronological and premature aging signs. Our skin deteriorates with age and its aging accelerates. Aging process varies from individual to individual and it has various origins. Among the most important factors of skin aging are: genes. Indeed, our genes accompany us throughout our whole lives. GENXSKIN is a new sophisticated and high-performance method that can protect the skin and stimulate its vital functions. In this facial, we are going to use all the energy of a powerful and innovative agent, which is capable of stimulating vital cutaneous functions with the aim of restoring the “triangle of beauty”. MATRIGENICS14 G, resulting from the latest research in biotechnology, is an active ingredient extracted from a brown macro-alga: Undaria pinnatifida, rich in ester of wakame or sulfated galactofucan. MATRIGENICS 14G fights against the reversed Triangle of Beauty and the installation of negative facial expression lines. 90mins customized massage using the most suitable techniques selected according to what your body needs and your wishes. Skin brightening treatment with peelings. ◎Cleansing, Gommage, Peelings, Face massage, Facial mask. ◎Cleansing, Lymph drainage, Face myofascial release, Calming mask. Using original DETOX OIL with 7 types of essential oils. Manual body massage without oil. Please email us to book your appointment!